Most shows are considered bad because they don't manage to keep the viewer's attention. However, Netflix seems to have found something that's really good. 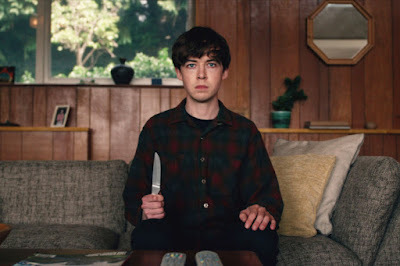 The show called THE END OF THE F****ING WORLD. The show is new with only one season out at the moment on Netflix. It also only has eight episodes at the time of writing this but has potential to get more since it seems to be popular. Its genres are drama, and comedy. This show follows two British teens in their adventures around the country after deciding that they want to get out of their piece of crap town. The teens also dislike their families and don't care for anyone around them since everyone just does the same thing. The two main characters are known as Alyssa and James. Alyssa seems to be a young teenage rebel who wants to explore the world and get to do things her way and learn hands on what she enjoys and what she doesn't enjoy. She also has no filter for her opinions and doesn't care what people think of her that much. James, on the other hand, is more subtle. He's usually quite and enjoys school because "it's a good place for observation and selection." He has some form of a filter and prefers to sit back and watch things happen instead of causing them or changing them. The overall show makes you feel like everything's a Bonnie and Clyde moment but doesn't fear of kicking, in reality, every now and then. The show manages to keep the viewer's attention without making any scenes feel forced. This show has a story that when mixed with good performances and wonderful writing keeps the viewer engaged and interested. Personally, I enjoy the show because I love comedy. I feel the show is good and keeps me entertained with the various situations that two main characters find themselves in. In my opinion, it's worth a watch.